Objective: The rise in use of antipsychotics among U.S. children is well documented. Compliance rates with current safety-monitoring guidelines are low. In response, the North Carolina Division of Medical Assistance established the Antipsychotics—Keeping It Documented for Safety (A+KIDS) registry. The initial objectives of the project were to successfully establish a Web-based safety registry and to obtain and evaluate clinical information derived from the registry. Methods: In April 2011, A+KIDS began asking prescribers of antipsychotics for children age 12 and under to respond to a set of questions regarding dose, indication, and usage history. Antipsychotic registrations were examined by linking North Carolina Medicaid prescription claims to registry entries. Prescribers were classified into different types, and the number of patients and registrations per prescriber were examined. The dramatic rise in antipsychotic utilization among adolescents and children over the past two decades is well documented and has been an issue of particular concern to patients, families, pediatric health care prescribers, public and private payers, and policy makers (1–13). The rise is overwhelmingly accounted for by increased prescribing of second-generation antipsychotics despite known metabolic side effects, a lack of long-term effectiveness and safety data, and growing concerns about cost (5–13). Multiple guidelines exist regarding safety monitoring for antipsychotics, yet rates of adherence to these guidelines are known to be poor (12,14–16). In response, a novel Web-based registry was designed and implemented for medical providers serving child and adolescent North Carolina Medicaid recipients. This effort, A+KIDS (Antipsychotics—Keeping It Documented for Safety), is jointly funded by the North Carolina Dr. Christian is affiliated with the Carolina Institute for Developmental Disabilities, CB 7255, Chapel Hill, NC 27599-7255 (e-mail: rob. christian@cidd.unc.edu). Dr. Christian is also with the Department of Psychiatry, University of North Carolina (UNC) Chapel Hill School of Medicine, Chapel Hill, where Dr. Sheitman, Dr. Barnhill, and Dr. Sikich are affiliated. Dr. Farley is with the UNC Eshelman School of Pharmacy, Chapel Hill, where Dr. Wei was formerly affiliated. Dr. Wei is now with North Carolina Community Care Networks, Raleigh, where Dr. McKee, Dr. Trygstad, and Dr. Pfeiffenberger are affiliated. Dr. Diamond is with the Department of Psychiatry, East Carolina University Brody School of Medicine, Greenville, North Carolina. Dr. Chrisman is with the Department of Psychiatry, Duke University School of Medicine, Durham, North Carolina. Dr. Lynn Wegner is with the UNC Department of Pediatrics, Chapel Hill. Dr. Palmes is with the Department of Psychiatry, Wake Forest University, Winston-Salem, North Carolina. Dr. Steven Wegner is with AccessCare North Carolina, Morrisville. Dr. Best is with the North Carolina Department of Medical Assistance, Raleigh. Division of Medical Assistance and Community Care Networks of North Carolina (CCNC), a statewide physiciandriven, managed care collaborative (17). A more detailed history of the current North Carolina Medicaid antipsychotic policy, a comparison with other state policies on use of antipsychotics, and the development of the A+KIDS registry are discussed in a previously published Frontline Report (18), and general information about the program is available atwww.documentforsafety.org. had a preference for fax or limited Internet access. The only requirement for automated medication approval by the system was a minimum amount of data entry by the prescriber. Unlike traditional prior-authorization programs, the A+KIDS system does not restrict access to medications based on protocols related to medication choice, dose, or indication. A+KIDS was designed to enhance patient safety by improving compliance with safety-monitoring recommendations, guiding prescribers through a decision making process on risks and benefits of antipsychotic use, and providing a platform for the ongoing tracking of patient side effects that can be evaluated at the patient, provider, or drug level. The A+KIDS system operates in addition to standard pharmacy level automated alerts regarding high dose, drug interactions, and therapeutic duplication. Pharmacy overrides are allowed to ensure that children are not denied access to prescribed medication, regardless of prescriber participation with the registry. This report focuses on two objectives related to the development and implementation of A+KIDS in North Carolina over the initial six months, April 12, 2011, through October 12, 2011. These objectives included establishing a Web-based safety registry as determined by prescriber participation and demonstrating the ability of the registry to provide an enhanced understanding about the use of antipsychotics from patient-specific data not available from Medicaid claims data alone. A+KIDS registry data and all Medicaid antipsychotic prescription claims for children age 12 and under were used to examine the initial six months of the registry. Patient, prescriber, andmedication-level perspectives were used when analyzing registry information content. We evaluated characteristics of registry patients age 12 and under from April 12 to October 12, 2011.
characteristics and diagnostic characteristics associated with the first antipsychotic prescription entered into the A+KIDS system for that child. To reduce prescriber burden, A+KIDS allows for the provision of only one primary psychiatric diagnosis and one primary target symptom. However, the registry cannot prevent prescribers from entering multiple diagnoses or symptoms within writein text fields or faxed forms. To account for these challenges, we developed a hierarchical classification of responses for primary diagnosis and primary target symptoms. [This scheme is described online in appendix C of the data supplement to this article.] Among the 5,532 patients in the registry, this process affected 276 (5%) diagnoses and 163 (3%) symptom classifications. In addition, we also sought to characterize prescribers. Prescribers were classified according to their credentials in the National Plan and Prescriber Enumeration System (NPPES) as physician, nurse or nurse practitioner, physician assistant, or missing if the prescriber had no credential information in NPPES. Although providers were not queried directly on their subspecialty or area of practice, the interface queried about the first prescriber, whether the patient also had a psychiatrist, and whether the current prescriber was a psychiatrist. Across prescriber type, we examined the number of patients entered into the registry per prescriber, as well as the number of registrations per prescriber. We examined registrations by linking Medicaid prescription claims to registry entries. Medicaid claims data were used to describe all prescription antipsychotic claims for patients age 12 and under in the Medicaid program from January 12, 2011, through October 11, 2011. For the purpose of evaluation of provider participation, a prescription was considered registered if it was filled or refilled after the A+KIDS registration for that medication was completed. Prescriptions were considered not registered if they were filled before medication registration or when no medication registrations were ever submitted for the medications. We examined the amount of antipsychotic claims that preceded entry of the information into the registry, at seven and 14 days after registry entry, and at any point more than 14 days after registration. Finally, we examined the number of total antipsychotic prescription claims paid monthly by Medicaid from April 12, 2011, to October 12, 2011, in relation to registered prescriptions over the same period. Antipsychotic user characteristics Characteristics of pediatric antipsychotic users as captured in the antipsychotic registry are shown in Table 1. A total of 5,532 unique patients were entered into the A+KIDS registry by prescribers. Eighty-one percent of patients were between the ages of seven and 12. Among this age group, 59% of antipsychotic users were non-Hispanic white and 29% of users were non-Hispanic black. More than 70% of pediatric antipsychotic users were male. We examined a number of resource utilization features at the patient level. There were few apparent differences regarding resources being used by younger children versus older children. However, younger children were more likely than older children to have never used antipsychotics (24% versus 13%) and were less likely to have been taking the same antipsychotic for more than six months (38% versus 57%). A majority of prescribers seeing patients were psychiatrists, seeing 55% of the younger group and 63% of the older group. Further, most prescribers initiating antipsychotic treatment were outpatient psychiatrists; prescribers who were not psychiatrists initiated treatment with antipsychotic medication less often (28% and 19%) for patients ages six and under and for patients ages seven through 12, respectively. A small number of prescribers who were not psychiatrists indicated that patients saw a psychiatrist as well. A minority of patients saw other prescriber types, including nurse practitioners and physician assistant psychiatric specialty prescribers or developmental pediatricians. Among patients ages six and under and those ages seven through 12, most were reported to be receiving psychotherapy. The most common types of psychotherapy among psychotherapy users were cognitive-behavioral or intensive in-home therapy. Prescribers did not know the type of psychotherapy being provided (22% and 23% of prescribers for younger and older children, respectively). The most common antipsychotic medications being used by patients in both age categories were risperidone, followed by aripiprazole and quetiapine. Few patients used other second-generation antipsychotic agents, first-generation antipsychotic agents, or long-acting injectable antipsychotics. Table 2 describes the characteristics of prescribers using the A+KIDS registry. In the first six months of availability, the registry was used by 730 unique prescribers. A majority of these prescribers were physicians (73%), followed by nurse practitioners and nurses (15%) and physician assistants (8%). The mean number of patients entered into the registry per prescriber was 8.3, with a median of 2.0, whereas the mean number of unique registrations per prescriber (including duplicate registrations per patient for multiple medications) was 8.9, with a median of 3.0. Overall, there were 6,473 unique registrations, excluding duplicates from the same prescriber, for the same medication, or for the same patient. The top 10% of prescribers accounted for a majority (56%) of all antipsychotic registrations. The top 5% of prescribers accounted for 40% of registrations, with a mean of 66.4 registrations per provider in that subgroup over the six-month period. Table 3 is a cross-tabulation of reported primary diagnostic indications and primary target symptoms for registrations. The top four diagnosis groups included mood disorders (predominantly accounted for by unspecified mood disorders, affecting 64% [N=1,261] of the mood group), autism spectrum disorders and developmental disabilities, disruptive behavior disorders, and attention deficit hyperactivity disorder. Aggression, irritability, and impulsivity were the highest-ranking target symptoms across these top four diagnostic groupings with few exceptions. One notable exception includes the target symptom of psychosis for schizophrenia and psychosis (81%). Overall, however, psychosis as a target symptom accounted for 5% of reported target symptoms. We linked prescription claims data to the registry data and examined the time between registry entry and an antipsychotic claim. Figure 1 shows that 50% of antipsychotic prescription claims (fills) were registered in the seven days before prescription fill and that 59% of prescriptions were filled within 14 days of registration. More than 90% of prescriptions were filled at some point after the date of the registry entry. Of note, 5% of faxed registry entries and 6% of online registry entries had a prescription claim preceding the date of the registration, with no claims after this date. In addition, 2%of online and 1% of faxed registry entries had no prescription fills in the claims data associated with information collected through the registry process. 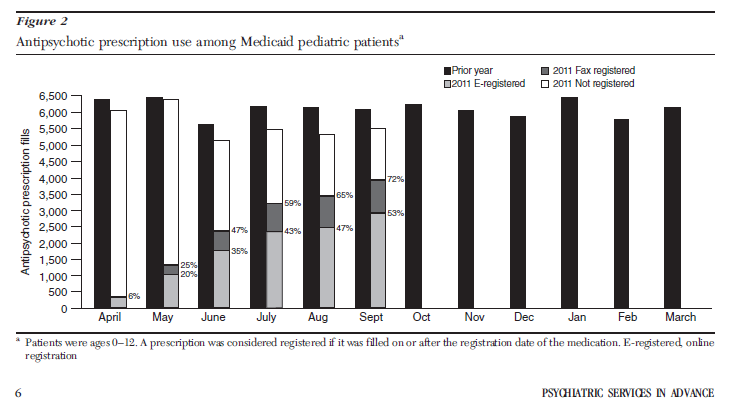 Upon matching antipsychotic claims to A+KIDS entries, it was noted that by the sixth month of the registry, 72% of antipsychotic claims in the Medicaid program were matched to an A+KIDS registry entry (Figure 2). A majority of these registrations were entered using the online A+KIDS system, whereas 19% were matched to a faxed entry. 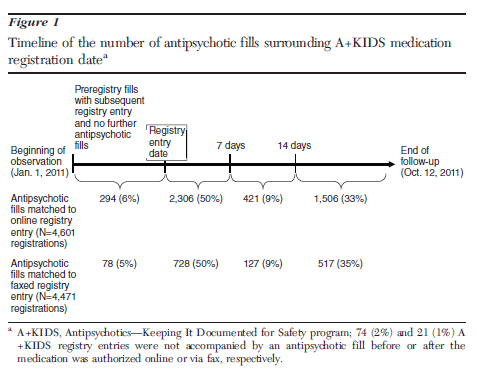 Figure 2 also demonstrates that total monthly antipsychotic fills after launch of A+KIDS were never as high as in any month in the prior year. fills were registered with A+KIDS and most prescriptions were filled within 14 days of registry entry. We used a relatively strict definition for registration for the purpose of analysis such that we may have artificially deflated registration rates. For example, if a child saw a prescriber and had the prescription filled the same day, before the prescriber was able to register the child, that fill would be counted as unregistered in the analysis. A very small minority of registrations were not matched to subsequent antipsychotic fills, implying that an antipsychotic medication was never filled or that a non-Medicaid source, such as private insurance, paid for the medication. associated with CCNC (17). Further, several features that separate A+KIDS from traditional prior authorization programs may have improved participation: no restriction on the choice of medication, simple registration criteria, instantaneous approval, and interactive educational features. Future features, including more educational content, prescriber clinical and communication tools, and maintenance of certification credit hours tied to participation, may serve to enhance participation. Further enhancements will also allow providers to track patient information longitudinally and compare features of their patients and their prescribing with those of their peers. These enhancements are aimed to make the registry a more useful tool and to motivate compliance with prescribing and monitoring guidelines. The initial findings presented in this report demonstrate the potential for a medication registry that captures clinical and utilization data not available from claims data alone. Several of the initial findings were provocative and raise significant questions about antipsychotic prescribing practice in North Carolina. For example, it is notable that a majority of registrations came from a minority of registered prescribers, suggesting highly varied practice styles or concentrated high-severity patient groups among certain prescribers or regions. Also, the data presented in Table 2 raise the possibility of differences in patients-per-provider and registration per-provider rates between physicians and advanced practice medical professionals. The registry will need to mature before this question can be analyzed, but such future explorations of the role of subspecialty prescriber type and other practice-level factors in antipsychotic prescribing practice may help point the way to targeted provider education initiatives, targeted mental health resource allocation, and policy formation. There is also a preliminary suggestion that overall antipsychotic prescribing rates have dropped since A+KIDS implementation. A future, more detailed time-trend analysis is needed to verify this apparent trend, but if borne out, one could postulate a range of underlying mechanisms, from raised awareness regarding the risks of antipsychotics to the increased labor of registering that prescribers may now associate with prescribing this class of medications. The clinical features of the group were notable in that aggression and irritability were among the top three target symptoms across nearly all diagnostic groupings. Unspecified mood disorder was the most common diagnostic group, which is notable because it is not a pull-down choice listed in the A+KIDS interface online and must be written in by prescribers. These findings are consistent with previous reports that the majority of antipsychotic prescribing to youths is off label. The validity of using off-label prescribing as a method for distinguishing non–evidence-based practice from evidence-based practice is often called into question by mental health clinicians. Of note, some psychotropic medications are used in the community and studied for years in open-label and small controlled trials before approval by the U.S. Food and Drug Administration is pursued or obtained. Given that off-label prescribing is so prevalent in child mental health and pediatric health care in general, this distinction may be far too blunt an instrument for determining approval in prior-authorization programs. The findings reflected in Table 3 also demonstrate the difficulty of attaining diagnostic certainty in child mental health and the profound symptom overlap across childhood mental disorders. These findings may support the notion that symptom-based prescribing dominates over disorder based specific treatment choices in child mental health. For example, aggression, although it may be a common associated feature, is not part of the DSM-IV criteria for any mood disorder, but aggression was overwhelmingly the top target symptom among children receiving an antipsychotic for a mood disorder. diagnostic data are verifiable. However, diagnostic data, symptom data, and some components of medication usage history data cannot be verified without a detailed chart review and independently performed direct diagnostic patient evaluation. rates and patterns, detailed evaluations of relationships between antipsychotic usage rates and prescriber subtypes, detailed descriptions and analysis of obesity rates among registrants, and the ongoing evaluation of the ability of the registry to influence prescribing trends over time. The A+KIDS registry was successfully implemented with a high rate of user uptake. It has demonstrated its ability to capture clinical information not available from claims data alone and illustrated its potential to point out provocative features of psychotropic prescribing patterns in North Carolina. The A+KIDS registry has demonstrated initial viability as an alternative to traditional prior authorization programs. With increasing prescriber usage, the addition of the adolescent cohort, metabolic data collection, and enhanced educational features, the registry is poised to fulfill its longer-term objectives of improving compliance with evidence based prescribing and safety-monitoring guidelines. This work was funded through a contract with AccessCare North Carolina. Dr. Farley has been a consultant to Novartis and Daiichi-Sankyo. Dr. Sikich has received research funding in the past three years from or participates in clinical trials sponsored by Bristol-Myers Squibb, Curemark, Merck, Forest, Otsuka Research Institute, SynapDx, and Seaside Pharmaceuticals, and she has received software for a computer intervention in schizophrenia from Posit Science. The other authors report no competing interests.